It’s a fact of life that some folks are perfectly happy to hold on to iPhones longer than others, or buy older iPhones instead of new. Perhaps they find the comparatively lower sticker price alluring, or they prefer a smaller profile, or they want fewer complicated bells and whistles. But whatever their reason, Apple apparently thinks intrusive advertising might just be the key to getting this stubborn contingent of users to consider pricier iPhone models. Earlier this week, owners in several countries of older iPhones — specifically the iPhone 5S — reported encountering unsolicited pop-ups in an unwelcome place: the App Store. After an unspecified time browsing, updating, or viewing the description of any given group of apps, some users were interrupted with an interstitial advertisement for the iPhone 6S. 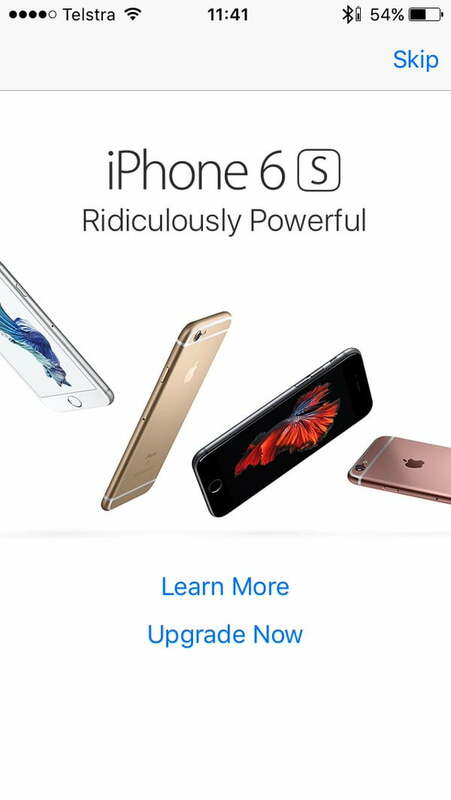 The ad, which touts the 6S as “ridiculously powerful,” includes a link to either “learn more” about the handset or “upgrade” to it through the Apple Store. The advertisement, the code for which may have been introduced in the iOS 9.2 update, is far more intrusive than Apple’s device campaigns have been historically. Promotion for new iPads and iPhones has previously been relegated to banner advertisements in the App Store, or sponsored collections of apps (i.e., “Enhanced with 3D Touch” or “Great Apps for iPad Pro”). The new pop-up marks the first time Apple’s rolled out a full-screen, albeit skippable, advertisement. Perhaps unsurprisingly, the overlay has prompted an outpouring of frustration on social media. The upcoming holiday season is the likeliest explanation for Apple’s aggressive, ramped-up marketing. Some analysts project the company could sell up to 78 million smartphones in the December quarter, up from 74.5 million iPhones a year ago. But others, notably KGI Securities researcher Ming-Chi Kuo, believe that decreasing supply chain orders of the iPhone 6S indicate diminishing demand for the handset. Exacerbating the slowdown is a sluggish broader smartphone industry: IDC predicts that the global smartphone market will slow in growth of shipments to 9.8 percent by the end of this year, down 27.6 year-over-year. Whatever Apple’s ephemeral motivations, the new advertisement seems to have gone a step too obtrusively far. They would even seem, as pointed out by The Verge, to run counter to Tim Cook’s 2014 pledge to avoid perceiving its users as “products” rather than “customers”; prolific Apple blogger John Gruber perhaps described the ads best as “uncouth.” They certainly feel that way.